Have you heard? Materials support has just hit the official SL viewer! To celebrate, we’re sending out a FREE update for our new Rustic Cabin (which is still on sale at Collabor88 for only $L288) – a version that includes custom normal and specular materials for an even more realistic visual effect! See the materials-enabled version in person at Collabor88! 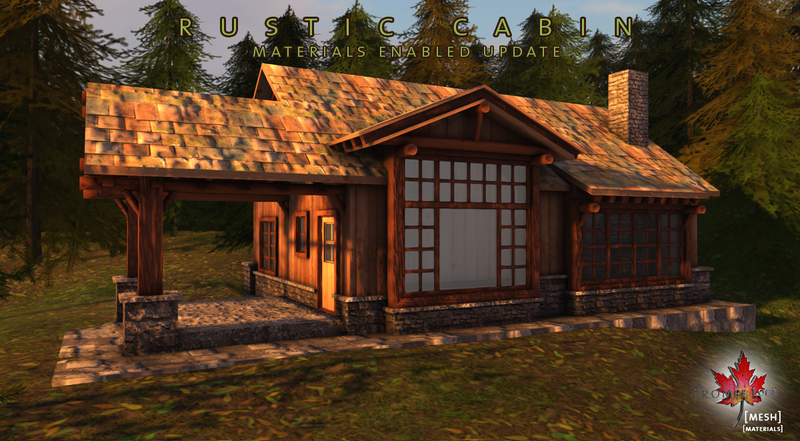 This update is free for all previous purchases of the Rustic Cabin, and will be included in all future purchases as well! What does this new materials feature mean for you as a customer? Read on! Materials – the addition of normal and specularity maps, for bumpiness/depth and shine control – are commonly used in other 3D game engines, and are now available for creators to utilize in Second Life™. These special textures make otherwise flat surfaces react with lighting sources so a stone wall now appears to have real depth and texture, especially when a light is moved across it. New specularity maps means that transparent textures, like windows, can now also have reactive shine as well! Currently, only the official SL viewer supports materials, although third party viewers should be catching up shortly – check your favorite TPV’s website for specific information on materials integration. See the official blog post that features a video of materials in action! Additionally, you also need to have the Advanced Lighting Model turned on under Preferences > Graphics tab. Most systems should support this feature; see the FAQ for a list of graphics cards that can run Advanced Lighting. Trompe Loeil is very excited for this newest feature and we’re looking forward to including materials-enabled versions in future products, as well as offering free periodic materials updates to older favorites. Products with materials will have the feature advertised on the sales image on the vendor.